Peru’s government has decided to extend to nine more regions a state of emergency called to cope with unusually cold weather and heavy snowfall. Until now, at least two people have died and 33,000 others have been affected by the cold spell, local officials say. Tens of thousands of animals have frozen to death over the past week. President Ollanta Humala has travelled to Apurimac, one of the worst-hit areas, to oversee the distribution of emergency aid. The state of emergency would be in place for 20 days, an official statement said. The heaviest snow fall to hit Peru in a decade has killed tens of thousands of llamas, alpacas, cattle and sheep, and left farmers destitute. 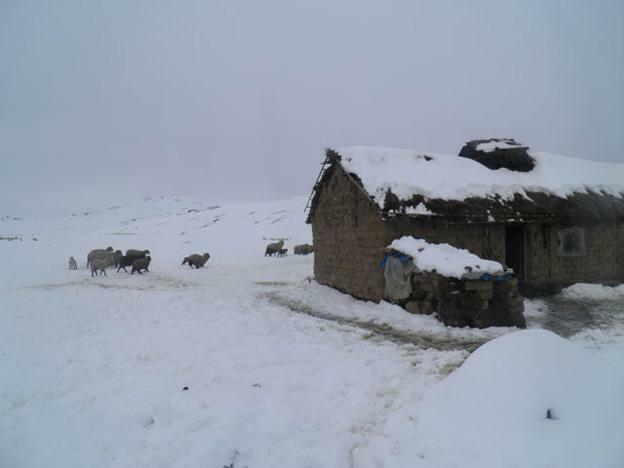 A man died when the roof of his hut caved in under the weight of the snow in southern Carabaya province but the circumstances of the second death were unclear. Three people were rescued on Saturday from the same region after their home was cut off by snow. Rescue workers said the three, two girls and an elderly woman, were suffering from frostbite and snow blindness. The cold front has also hit Peru’s south-eastern neighbor, Bolivia, and Paraguay, where a combined total of five people have died.